27-yard spool of 1 inch wide white adhesive velcro. BookZup is the world’s easiest simplest and most economical book holder. You can turn pages easily and it allows for more room on your desk. These BookZups are covered in a backpack material that gives them a clean, professional look. White Foam Rollers are cylindrical in shape, lightweight and made of a high quality foam. Use the foam roller for myofascial release, muscular flexibility and dynamic strengthening. A stretchy tape used to promote muscle strengthening and shortening. This tape works great at shortening and strengthening muscles used to stabilize the scapula. The tape is marvelous for many procedures. 5cm wide. The Movin’Step uniquely combines a dual purpose into one product. 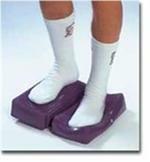 Movin’Step can be used for low impact cardio-vascular training or as a moving base to improve balance and coordination while exercising. Need to deflate those balls for the summer or vacation? Use the plug puller and save the finger nails and teeth. It makes a difficult job easy. The best plastic scooter board on the market for the price. Large nylon wheels make rolling and maneuvering a snap, plus it has handles!